When it comes to touring, Washington D.C.’s 9:30 Club is consistently the place to catch the best shows (from a sound perspective), as shown with its multiple Pollstar and Billboard touring awards, and snagging the #1 spot on Rolling Stone’s 2013 “The Best Big Rooms in America” survey, the 9:30 Club has remained an essential stop for most major tours since its opening. The entrance to the 9:30 club at 930 F St. NW in Washington D.C., photographed in the 1980s. Established in 1980 at its original location at 930 F St. NW in Washington D.C. (the venue was named after this location), this 1,200-capacity live club has hosted performances by some of the greatest artists to come from the alternative rock and punk scene, including the Psychedelic Furs and The Ramones. According to Shawn “Gus” Vitale, the 20-year front of house audio technician at the 9:30 Club, the venue has always pushed the envelope, both musically and technologically, welcoming each performer with that same wow factor that a multi-platinum artist would receive. “Our thing is that we always like to treat our bands like they’re the next year’s headline band,” Vitale said. As the venue rose in popularity, it played host to some of live music’s most iconic moments—in 1981, the club broadcasted reggae band Steel Pulse’s US debut live on the same night of Bob Marley’s funeral; in 1998, Radiohead played a surprise show after the RFK Stadium was rained out; and in 2004, The Beastie Boys made their return after a five year hiatus. But even with such big name in music history, the 9:30 Club is no stranger to change—it relocated from its original location to 815 V Street NW, opening on January 5, 1996, and continues to upgrade itself to keep up with the changing industry. More recently, the venue moved into the digital realm with the purchase of a new DiGiCo SD8 console. The upgrade came about as a result of the owners and operators of the 9:30 Club, I.M.P., an independent concert promotions company that exclusively books Merriweather Post Pavilion in Columbia, MD and produces shows in a variety of venues throughout the region, being selected to also operate the historic, city-owned Lincoln Theatre. 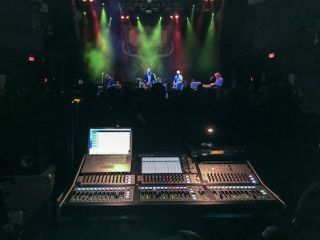 The 9:30 Club's former FOH desk was relocated to the venue's monitor position, with the previous monitor desk moving over to the Lincoln, and the new DiGiCo SD8 system was purchased to replace the house console. The 9:30 club recently upgraded its FOH console to the DiGiCo SD8. The console works great with the venue’s current PA system, a d&b audiotechnik J series with B2 subs, which the venue installed back in 2008, explained Vitale. “I think when it comes to venues, we’ve definitely pushed everyone to up their games nationally. We like to think that we’ll push the envelope a bit, and we’re lucky to have owners who put money into getting gear that makes the acts sound great,” he added.